A program is presented by the author in Badi Shoch Ka Bada Jadu for getting the best from one’s job, community, and marriage and family life. Badi Shoch Ka Bada Jadu is the Hindi translation of David J. Schwartz's best seller The Magic of Thinking Big. The author’s point of view is that thinking big is the way to success, that is, thinking positively about oneself. The main stumbling block that prevents many people from succeeding in their life is the smallness or inconsequential nature of their thoughts. Schwartz tries to prove that it is not necessary to have an inherent talent or be an intellectual for attaining success, but there is a need for a person to understand and learn the habit of behaving and thinking in ways by which he or she can reach the top. His book begins with the story of a salesman who is able to sell more, and make more money than his co-salesmen. He is not highly qualified, influential, or smarter than his friends. However, he just decides that he should sell more and eventually he achieves what he wants. Schwartz further encourages the reader to look at all possibilities in a situation and not just what meets the eye. Through his next message, Schwartz stresses the need for broadcasting good news. In other words, by conveying a good news to one’s friends while talking to them, they feel good and and so does the person who conveys the news. This is a win-win situation according to him. 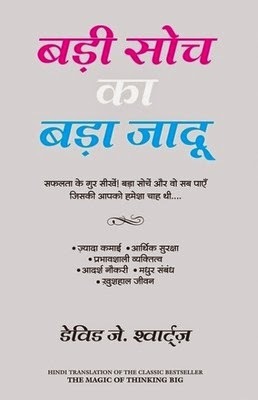 Badi Shoch Ka Bada Jadu is a book on self-motivation and the reader is shown the way to self-dependence. The book also aims to build self-confidence in the reader. Through this book, the author encourages his readers to think big, avoid negative thoughts, and make informed decisions. David J. Schwartz was born on September 22, 1970. Some of his other books are Maximize Your Mental Power, The Magic Of Thinking Success, Superpowers, and The Magic of Getting What You Want. His book Superpowers was a finalist for the Nebula Award. Schwartz is an American fantasy and science fiction writer.